My education in cheesemaking has been continuing as you will have seen if you follow any of the Hooters Hall social media. 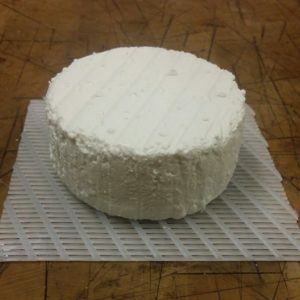 I’ve been experimenting with aged Chèvre. Five weeks ago I made some Chèvre using shop bought milk. I let the curds ferment in the whey for 4 days and then ladled them into small cheese forms to drain before surface salting. I found handling the curds while they were still so wet very challenging and couldn’t avoid one complete collapse but I persevered. I let the cheese drain and then dry and cure for several days at room temperature. I’ve bought a set of roasting trays which have a wire rack over a metal tray making them perfect for no fuss cheese draining. 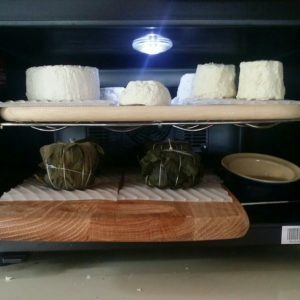 After curing I put my little, slightly misshapen cheeses into my cheese cave which is a small wine fridge that I bought for the prupose. I’ve have several oak chopping boards to use as shelving and a hygrometer to monitor relative humidity. I keep a small ramekin on water in there to help maintain the humidity and the fridge has an external temperature control and display. We had the first taste of these cheeses after 2 weeks of ageing. The cheese was very acidic with a hint of citrus and proper goat cheese clagginess. I then let the remaining cheeses age for a further 3 weeks and we tried some more this weekend. The flavour had changed significantly over the 3 weeks. The acidic, citrus taste had completely gone and was replaced by a strong, complex goat cheese flavour. The texture was quite dense and smooth. Overall I was very pleased and I’m looking forward to seeing how the flavour develops over a full 60 days of ageing. 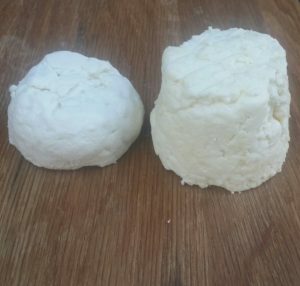 This cheese is pictured on the left in the photo below. The cheese on the right in the photo is another aged Chèvre this time made from raw milk. For this cheese I let the curds ferment for 2 days. I pre drained the curd using my normal cheesecloth in a colander method because I’d found dealing with the draining curd in the cheese forms too fiddly. I salted all of the curd together and then put it in the cheese forms. The pre draining meant there wasn’t any need for further draining but I removed from the cheese forms after 24 hours and let the cheese cure at room temperature for a few days before transferring to the cheese cave. We had our first taste of this cheese after 3 weeks of ageing. It wasn’t as strong as the first cheese but had an enjoyable clagginess and creamy flavour. It was drier and more crumbly in texture probably because of the pre draining. I am leaving some of this cheese to age for a full 60 days but I have decided to experiment with leaf wrapping four of the cheeses. 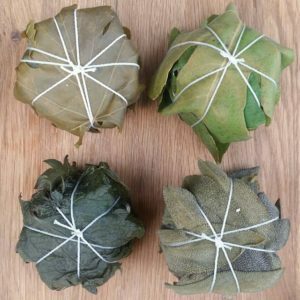 Wrapping cheeses in leaves has been practised as long as cheeses have been made with cheesemakers making use of local vegetation. As a keen gardener as well as cheesemaker this is an area of cheesemaking I’m really interested in. Leaves can be used dry but you can also macerate leaves in alcohol before wrapping. Essentailly this means leaving them to soak in alcohol for a week or two. I decided to use leaves from the smallholding. 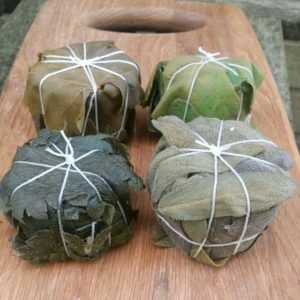 I picked some vine leaves and fig leaves from the polytunnel, sage leaves from my herb garden and some nettle leaves from our small woodland. I soaked the vine, fig and nettle leaves in homemade Elderflower champagne and the sage leaves in an organic cider. 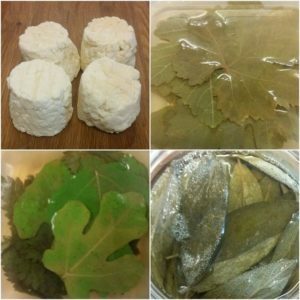 The hope is that the combination of leaves and alcohol will have a positive effect on the flavour of the cheese. The leaves also protect the cheese, creating it’s own little micro climate. Wrapping the cheeses wasn’t too hard. I used several leaves for each cheese and simply overlapped the leaves then secured them with cooking string. I found it easiest to apply the leaves around the middle of the cheese first and secure with string then fold those leaves over at the ends and add more leaves until both ends were covered before securing all the leaves with some more string. Of course the shape of your cheese will affect the ease of wrapping. Here are the finished cheeses. These leaf wrapped cheeses have now been put back in the cheese cave to complete their ageing. I plan to open them after a full 60 days of ageing. It will be interesting to compare with the non leaf wrapped, naked cheese. 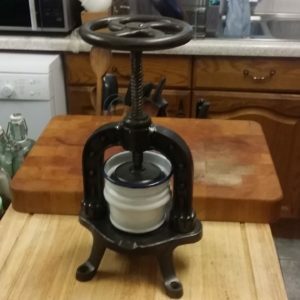 I used shop bought, pasteurised goat’s milk, let the curd ferment for 2 days before pre draining, salting and then pressing in a cheese form for 2 days turning the cheese after 24 hours. I’m going to let the cheese age for 4 weeks then try soaking it in red wine before letting it finish ageing. It should be ready on Christmas eve. Other cheese plans include experimenting with using herbs to coat the cheese and layering with herbs. I also want to try making different shapes of aged Chèvre because the shape influences the way the cheese ripens. The relationship of surface area to volume being the important factor. Cheeses with a higher surface area to volume ratio ripen more quickly from the exterior than those with a smaller ratio. Larger cheeses with lower surface area compared to volume will ripen more from the interior. Smaller or flatter cheeses, those with square edges, or long cylindrically shaped cheeses tend to ripen from the exterior. There are ash ripened cheeses to explore as well. I’m going to try making m own cheese ask using the prunings from my fruit trees. © 2019 Hooters Hall. All Rights Reserved.